Housing an array of decking products such as the Envision Distinction®, Envision Inspiration® and Envision Expression® lines, TAM-RAIL® and Marquee Railing® systems, and various fastener accessories, TAMKO® has built a reputation for furnishing materials that likewise emphasize the pursuit of elegance and beauty. With Envision® decking, you know you are investing in the best for your outdoor living space. Founded in 1944 in a Joplin, Missouri, streetcar barn, E.L. Craig crafted the beginnings of the building company that we all recognize today. Mary Ethel, Craig’s wife, decided upon the name TAMKO® as a way to pay homage to the five states where the company intended on providing its business: Texas, Arkansas, Missouri, Kansas, and Oklahoma. Mary Ethel would eventually assume the leadership of the company in 1954 due to Mr. Craig’s health, and their daughter, Ethelmae, began her long-term position as a director of operations around the same time. Moreover, Ethelmae’s husband, J.P. (Jay) Humphreys, joined the company in 1956, setting the foundation for him to become president of the organization four years later. Over the next three decades, Jay Humphreys led TAMKO® to the rise of national accreditation by expanding production to cities such as Phillipsburg, Kansas (1969); Tuscaloosa, Alabama (1975); Knoxville, Tennessee (1976); Frederick, Maryland (1978); and Dallas (1985). After several other periods of expansion throughout the 20th century, the company finally made the decision in 1999 to enter the trade of composite decking manufacturing by purchasing the necessary equipment in Lamar, Missouri. 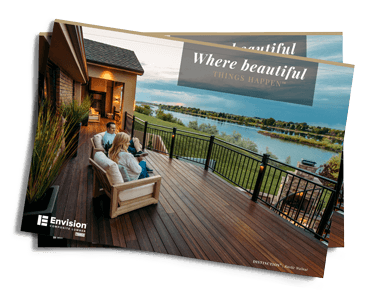 From there, the Envision® composite decking collection has continued to grow and distribute the utmost quality of outdoor decking essentials to customers across the U.S.
Our commitment to and drive for quality is made evident by our rich history of growth. While we may not operate out of a streetcar barn anymore, we are proud to still be headquartered in the city where it all began: Joplin, Missouri. Our rise to prominence serves as a testament to the satisfaction we provide to customers and our standard of building products. When you are in need of building a beautiful outdoor living space, look no further than Envision® Decking.